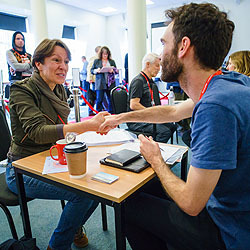 OK take a deep breath… and check out who you can pitch YOUR projects to this year at The Great British Pitchfest! Execs will be added in late Summer. Sixty professionals from over fifty companies heard pitches at the last Pitchfest, leading to hundreds of script requests. Execs, Producers, Directors and Agents attended from these companies in past few years. Looking for comedy scripts, but honestly love anything that feels refreshing or revealing of a world (fictional, fantastical, or real) that I wouldn't otherwise experience. Looking for character-driven stories in which a strong protagonist has an arc as fulfilling as the plot. Any genre considered. Looking for writers who know how to collaborate and take notes and are highly skilled in story structure. Looking for futurist leaning or science fiction ideas that are moving and inspiring more than dire and apocalyptic. Open to all genres, but looking to focus on comedy, preferably in TV. Looking for fun concepts and looking to laugh. Looking for character driven narratives, across all genres that tackle topical subject matter. I have a number of projects in active development and am always on the hunt for fresh voices and new material. She has a passion for out of the box stories. Looking for high concept thriller / horror / adventure material. Looking for drama and comedy that compels, surprises or sheds new light on well-trodden genres and subjects. We look for both international-skewing and local, regional-set narratives, but keen for premises that can sustain for multiple series. Currently interested in compelling character driven stories, either feature film or tv series format. Preferred genres are contemporary and historical drama. Low to mid budget level. Looking for: Exciting stories told with that little bit of stardust. Looking for Dramas (occasionally comedy-dramas) which say something important and meaningful about the world. While continuing looking for projects with fresh takes on genre films (horror, thriller, sci-fi), we are also interested in topical stories with a strong voice and theatrical potential. Film & TV - Looking for prestige material, whether that be quality character-driven dramas with a commercial edge or action-based narratives with strong premises and meaningful messages. Always looking to support talented writers whatever the concept. Looking for ambitious writers with big, purposeful stories to tell. International / cross-border storytelling a plus. Queensbury Pictures (and MPI) are genre-focused, but "genre" covers a very wide arena, not just straight horror but the darkest thriller (STARRY EYES), blackest comedy (CATFIGHT) anything that combines genuine edge and potency. Interested in scripts with mainstream ambition - think big! Aim high - take on the challenge of BBC1, ITV1 and Sky1! Looking for projects to co-produce with the major platforms like Amazon, Netflix and Apple. Looking for strong dialogue and character-driven stories which can be brought to life as immersive interactive experiences across mobile and games platforms. Looking for commercial Drama that that can compete on the international stage and appeal across the globe. Open to drama in many forms from Series, Serials and Miniseries in all genres however we are always particularly interested in Crime and Thrillers. Interested in bold and compelling drama series for international audiences. Bonus points for crime/thriller elements, well-developed characters and returnable series. Looking for projects that will work or can be adapted for Vietnamese audiences. In particular I love to find a high concept action thriller with a good twist. Bonafide is looking for meaningful and idiosyncratic TV drama scripts. No genre is off the table, but a relevant, compelling and contemporary narrative is key. We like scripts that surprise us, that deliver big ideas from a shiny new perspective; that resonate with audiences and encourage them to look at the world in a new way. Actively seeking, bold, thought-provoking, and challenging drama. Looking primarily for film comedy and drama. Or scripted TV comedy. Currently seeking: Projects that tell a compelling story, are in an identifiable genre and would have international appeal, and ideally have budgets of up to £5m. Looking for exciting stories told with that little bit of stardust. Looking for character driven thrillers, elevated horrors and high concept scripts. Low to mid budget ranges. Looking for strong female driven drama/thrillers, adventure/action, posh horrors and high concept scripts. Looking for character driven drama, contemporary stories and writing with wit, warmth and ambition. Considering drama and comedy scripts. Looking for new writing talent that displays a distinctive, authorial voice. Interested in drama, comedy/drama or comedy ideas for returnable TV series/serials with a clear sense of tone and format. Interested in English language projects - authentic British stories revolving around authentic, relatable characters with unique voices which could play on BBC 3 or C4. Otherwise, well-written and plotty genre are always a good bet! Looking for scripts that make an audience laugh or cry. Ideally with a budgets of £2m and under for film. TV budget unlimited, open to everything. Low-med budget film proposals: there is a wide range of things we would consider, from personal dramas with GREAT characters to genre ideas that don’t feel off-the-shelf and we are particularly keen to hear stories told from a female perspective. Looking for 60 minute TV drama ideas of any genre for UK broadcasters, so should ideally have some British element in the idea. Other than, just looking for quality and originality. Open to all projects but specifically looking for character-driven, returnable TV dramas with a strong sense of place (think Doc Martin, The Durrells). Shannon is most attracted to scripts that offer a personal, sideways look at larger social issues. Emerging Producer looking for bold, character led, genre bending stories. Particularly excited by debuts on smaller budget scale, that champion marginalised voices. Midsummer Films is primarily looking for genre based films, including action, adventure, thriller and sci-fi. Looking for entertaining stories with quality performance-driven drama supported by genre elements. We specialise in European co-productions. Cannibal Films is looking for film and TV genre content with depth and international appeal-unexpected, imaginative, and sizable stories that not only understand their audience, but aim to capture new audiences too. Mid to high budgets preferred. Looking for anything interesting and good! No specific genres. Film and TV. Make Films are keen to hear about scripts that would appeal to 18-30 year old audiences, narrative led VR shorts, and are open to anything unique and character driven, ideally low budget productions. Looking for writers with a passion for creating children’s shows; I’m looking forward to hearing about your experiences in the ‘smart, fart, heart’ school of writing! Goldfinch is looking for commercial genre features under £3M. Interested in particular in sci-fi, action and horror stories with a fresh hook and international appeal. Not looking for British comedy. Sci-fi, political drama, art house, European thriller, Experimental mixed drama/documentary (not drama-docs), historical, westerns. Currently seeking: Live action - Adventure, thriller, sci-fi, comedy/romcom, family. Animation: Family/fantasy. Looking for a good “hero’s journey” that tells a human story. We are also interested in thrillers and stories with a lovely twist. Changing the audience’s expectations and getting them “off guard”. Cannibal Films is looking for film and TV genre content with depth and international appeal-unexpected, imaginative and sizable stories that not only understand their audience, but aim to capture new audiences too. Mid to high budgets preferable. Looking for: Fresh, compelling, contemporary thrillers and high concept comedies. Entertaining stories, particularly interested in musicals, horrors and comedies. Film and television. Phil is interested in drama and comedy writers for television, film and radio. Elaine is an agent representing writers and directors in film, television, stage, radio as well as a few book writers. Looking for high concept, speculative fiction stories – Fantasy, Horror, Sci Fi, Thriller, and Period drama. Looking for TV and FILM content with strong gritty emotional pull, adaptations and action.